Audio-Technica has awarded Online CRM Marketing with its President’s Award, for its work representing Audio-Technica’s professional line of audio products in Michigan during the 2015/2016 fiscal year. Glen Cordial, Online CRM marketing principal, and Brian Baldwin, Online CRM marketing, sales, and technology expert accepted the award, which recognizes a leading manufacturer’s representative for outstanding commitment and dedication. 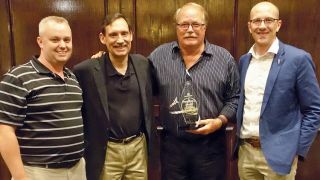 Philip Cajka, Audio-Technica U.S. president and CEO, and Andrew Pernetti, Audio-Technica territory manager, professional markets, presented the A-T President’s Award at a ceremony during the 2016 InfoComm Expo on June 7 in Las Vegas, NV.